RedtuzkUI is an external edit for ElvUI and Shadow & Light. It's a clean yet functional interface, that doesn't skimp on usability for the sake of aesthetics. The UI is designed for DPS and tanks, with a healing profile coming very soon. It's intended use is for 1920x1080, but it will work on other resolutions aswell. Active community Discord server with RedtuzkUI support, feature requests, and WeakAuras and macro help. When you first log in after installing RedtuzkUI, you will be prompted with an installation window. Please go through it carefully and select the desired options. If you're already an ElvUI user, we highly recommend that you select the 'Create New'-option when asked about your profile setup, as that will preserve your current profile for later use. When you've completed step 7 of the installer, make sure to press 'Finished' as this will apply the necessary modifications. Redtuzk for starting and managing the project. We invite you to join our fantastic community Discord server! 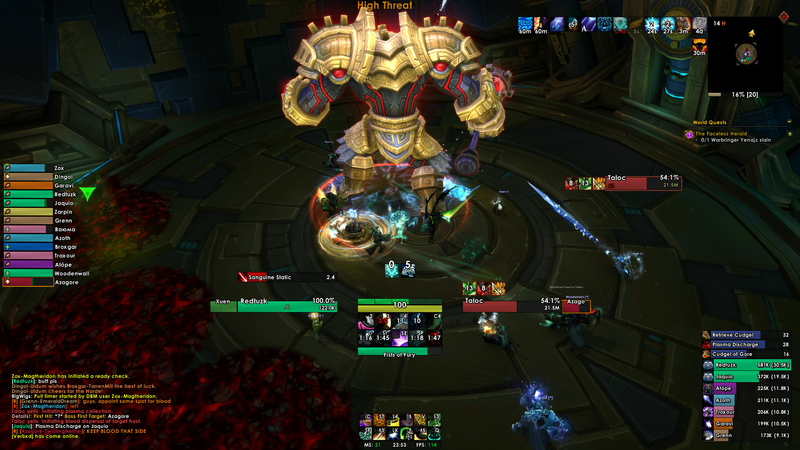 Here you can find help with any aspect of the UI, be up to date with the latest and upcoming features, request features, get help with WeakAuras and macros, and chat with other interface nerds in our active general chat. Removed a tweak that was broken in the ElvUI update. Stack text on aura icons near the minimap will now be slightly off centered but RUI will load. Fix for those coming later. Removed unneeded settings from the Treant style filter, this should prevent errors when importing. Entering "/run RUI:TreantNamePlateFilter()" to chat *should* import the style filter for existing users who don't want to update the layout. Removed old NamePlate settings from the healer profile. Users should be able to install using the healer layout again. Fixed the Treant threat style filter for new users. It probably still wont work for old users without re-apply the RUI layout first. Entering "/run RUI:TreantNamePlateFilter()" to chat *should* import the style filter for existing users who don't want to update the layout. Fixed the NamePlate settings, they should import correctly now. Temporarily added a page for updating NamePlates. This should allow people to update their NamePlates without changing anything else. Moved the Treant Threat feature into a NamePlate style filter. Everything should still work the same way as before. Added feature to have Druid Treants behave as tanks. When a treant is tanking a mob it's nameplate will be locked to the "tanked" color. For this feature to work the tanked color must be enabled in ElvUI's nameplate settings. There's a toggle for this feature in the RUI settings. Added a Combat timer under the Details frame. Removed the Shadow & Light background for Details. Updated the Details appearance settings. Changed cast bars to use a custom color, hopefully this works this time. Fixed the lua error that occurred during installation due to missing S&L movers. Fixed the Boss Buff positioning...again. Fixed BigWigs not using the correct font. Fixed the WeakAuras templates, they shouldn't cause errors anymore. Fixed the 5x2 layout not reapply correctly after a user selected one of the other layouts. Fixed a typos in the installer's text. Updated the WeakAura Templates. The stacks text is now green by default. The custom text portion of the aura's has also be updated to better respond to WA conditions. Color changes will now work. Color changes should be made to the text associated with the custom text. Fixed an issue that caused the installer to give an error on the party frames portion of setup. Settings were applied correctly but the call to update the ElvUI frames causes an error due to an out of date setting. Added a check for major vs. minor updates. The installer will now only appear and prompt the user to update after major changes. Removed the artifact datatext settings as they are no longer used in ElvUI. This should fix the errors people were having when running the installer. Updated the druid healer buff indicators. Fixed the installer for healers. It should now work properly. -- The healer layout is finally here! Still a WIP though, especially the filters. Feedback is very appreciated. If you need more actionbars than what is shown by default, uncheck mouseover on bar 3. While a basic configuration is provided, you might have to slightly adjust the buff indicators to your liking. Brand new party frames specifically made for m+, which are closer to the center and shows party powerbars, raid icons, buffs and debuffs. Player castbar text is now centered properly. Fixed font not applying properly for people with AddonSkins enabled. The installer will now detect if the user has installed RedtuzkUI before, and present the option to load the previously installed profile when logging into alts for the fist time. Added a description showing the currently loaded ElvUI profile to the "Select Profile (page 2)" page of the installer. Slightly change the tooltip styling. Moved the GM helper frame. Moved the Vehicle Seat display. Changed player castbar color to blue. Moved bar 5 (mouseover bar) to prevent the issue where the last few buttons would sometimes be inaccessible. Added decimal display to the [power:currentreal] tag to match the ElvUI tag [power:max] use on the target mouseover power text. Fixed a bug that caused the Layout portion of the installer to break due to missing nameplate filters. Changed the bagsize slightly, also added currency display at the bottom. Fixed the powerbar, classbar and castbar being 1 pixel too long on the 8x2 layout. Fixed a bug that occured when the user disabled player buffs. Added options in the installer for how the target buffs and debuffs are display on the target frame. Moved the loss of control icon up slightly. Slightly increased the font size of the chat tabs. Changed positing of the voice chat menu. Added additional info on the WeakAuras installer page for user who are updating. Fixed the installer being confused about the user's version number and always showing update pages after selecting an action bar layout. Issue occurred when the ElvUI profile export was done on a different version of the installer. The latest version of this addon is 1.7.4 and was uploaded on Apr 07, 2019 at 15:56. This file was last downloaded on Apr 18, 2019 at 15:24 and has been downloaded 28887 times. Hi, I wanted to ask how can I change the font size of the buffs of my target. I tried to change directly on the slider but nothing happened ? Please join our discord server so we can help you out! Hey Guys, love that UI but suddenly since yesterday, it completly disapear and i cant find it into my addon list in game...but i still see it in the addon list at the choice caracter page and in the folder Interface also. Some manipulation to do ? Thx for the beautiful work ! @Horcane Everything should still work in 8.1 but there is an update planned for this week. Love the UI, it's awesome. One question though, what is the panel at the bottom right under the DPS meter? I like to have 2 windows, one for dps and one for damage taken and can't figure out how to adjust that backdrop panel. I love your Ui ... !! But !! - I don't find a way to get along with the voice chat with your Ui. I have to close it every time to join a channel. This is the best UI you can get, well supported and with fantastic Developers! It also includes a FANTASTIC selection of WeakAuras available for any class and spec that you can download from their Discord! Amazing! Very nice UI @Redtuzk. I used your Elv profile at the start of WoD. This is top notch stuff. This is the best UI I've ever used. I've been updating/customizing these things since Vanilla. I'm extremely happy that it's been updated for BFA. I will be updating my current RedtuzkUI when I get home. Thank you very much for doing this! Hey Obs! Happy to hear from you. Hope to see on Discord! You must be logged in to comment. Please login.